At Applications Engineering, we design and supply a wide range of level switches for fluid process and control systems in many industries. 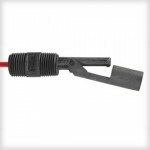 This includes horizontal level switches constructed from a high-quality polypropylene, nylon and Versaplast. This design allows a level switch to be installed inside a tank that is difficult or impossible to access from the top or bottom, and the material choice enables a long-term reliable performance in oils, fuels, broad chemicals and various corrosive fluids. Our range of horizontal plastic level switches has been chosen and tested long-term durability, ensuring that our customers always receive reliable, high-quality products at a cost-effective price.